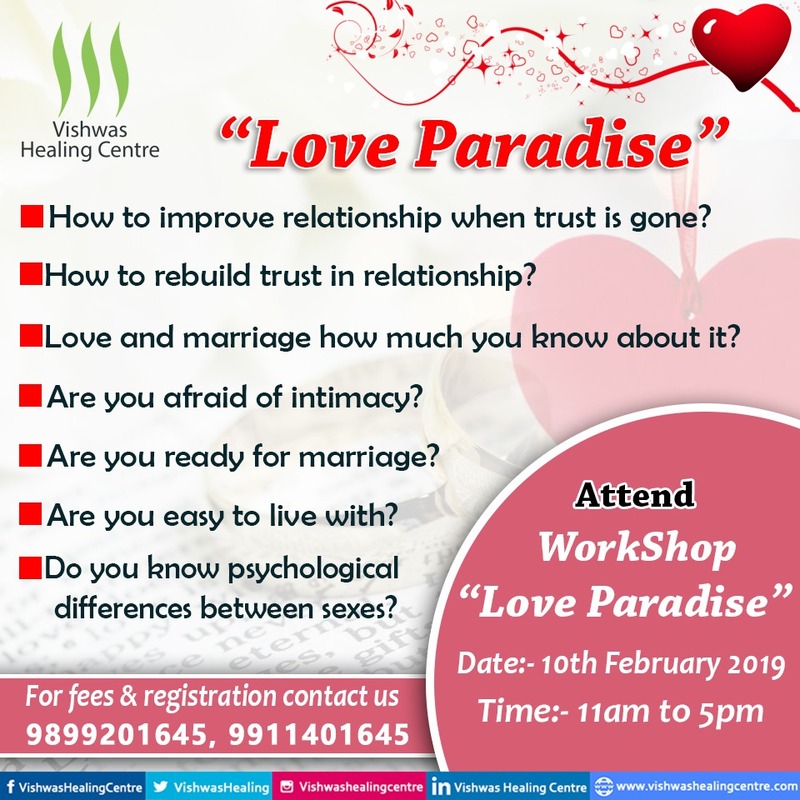 We are conducting a “RELATIONSHIP WORKSHOP” called “Love Paradise” on 10th February 2019. The objective of this particular workshop is more emotional awareness in your relationships, empowerment in life, psychological awareness and subconscious healing through the topics that we intent to cover. It is for everyone above 18 years. So keeping all this in mind, we have decided to give you the workshop on a very highly discounted pricing. This workshop on relationships for sure will explore where you are at in your current relationship and learn how you can achieve a mutual space for growth and evolution. So we expect greater participation. The workshop is not just for someone who is married or in courtship but for even so called singles because you are all humans. And humans necessarily depend on one another, as in you can’t live all by yourself. It’s indeed a life skill & needs to be upgraded regularly for one’s own highest good. In this retreat, you will learn tools to develop yourself in your relationships. These include: Defining Love, Understanding Partner Selection, Distinguishing Real Love From a Fantasy Bond, Becoming More Loving etc. Once you have a complete understanding of this, we will have you walk through a timeline of your life discovering the blessings, lessons, gifts and value of the events of your life. You will also be empowered to boldly step into your future fully equipped to respond, rather than react, to the events of your life. For fees details & registration contact us 9899201645, 9911401645 or Visit https://bit.ly/2Cc489b ! !